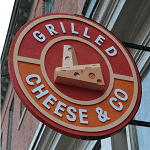 About Grilled Cheese & Co.
Pepper jack cheese, grilled chicken, diced red onions, and sweet BBQ sauce. Fresh mozzarella, provolone cheese, fire roasted red peppers, basil pesto, and balsamic glaze. Melted Monterey jack cheese on top of our homemade crabby dip loaded with sweet claw crab meat. Swiss cheese, smoked ham, and grilled chicken served with a dijon mustard sauce. Brie, mascarpone cheese blended with raspberry preserve, and chocolate chips. Made with American cheese and grilled to perfection. Delicious layers of aged cheddar crumbled smoked bacon, and freshly diced tomatoes. Havarti cheese with a medley of roasted vegetables and olive tapenade finished with a rosemary black pepper aioli on whole grain bread. Provolone cheese with hand pinched Italian sausage, roasted peppers, and onions topped with marinara sauce. Crumbled blue cheese and roast beef topped with a horseradish sauce. Provolone cheese with Italian meatballs, marinara sauce, and finished with a touch of parmesan cheese. Our "famous" underground sandwich. We start with our housemade crabby dip thats loaded with sweet claw crab meat then top it with cheddar cheese, grilled chicken, and bacon, then grill it up on ciabatta. Cheddar cheese, grilled chicken, and crumbled smoked bacon, finished with ranch dressing. Provolone cheese, Parmesan cheese, grilled chicken, and marinara sauce. Provolone cheese, Parmesan cheese, grilled chicken, and basil pesto. Provolone, fresh mozzarella, olive tapenade, diced tomatoes, and red onions, finished with balsamic glaze. American, cheddar, swiss, provolone, and Monterey jack cheeses. Fresh mozzarella, provolone cheese, grilled chicken, fire roasted red peppers, and basil pesto, finished with balsamic glaze. With diced tomatoes, shredded Parmesan cheese, and croutons. Fresh and crisp salad medley, topped with shredded cheddar, diced tomatoes, red onions, and choice of dressing. Romaine lettuce, Parmesan cheese, and croutons tossed with a creamy Caesar dressing. Fresh and crisp salad medley topped with crumbled blue cheese, bacon, red onions, diced tomatoes, roasted vegetables, and croutons with choice of dressing.